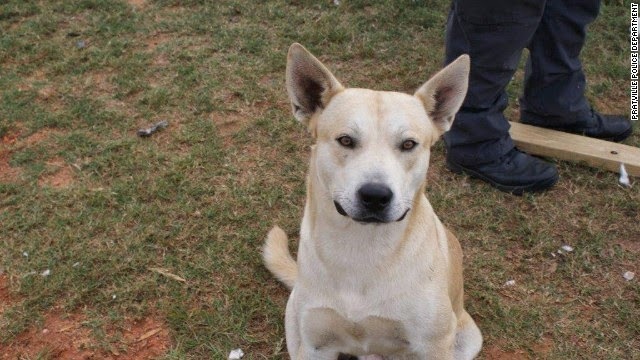 Alabama dog Bo might be a bit more enthusiastic to see his owner than the owner would have wanted - Edward Henderson was hiding from the police, and Bo's fervently wagging tail revealed him. The story starts when local police came to Henderson's house with a drug search warrant. The press release says, "As officers were pulling up to the residence, the suspect Edward Melvin Henderson fled on foot towards the rear of the residence. At the rear of his residence was about a 25-foot ravine. Henderson jumped off the ravine and continued running." This is when Bo entered the picture. The husky/pit bull mix came up to the investigators, who pointed at Henderson and told the dog to "go get him." Bo was happy to comply, and eventually found his master hiding in tall grass. Henderson is now taken into custody on several charges, and Bo is staying with relatives. The police department has communicated through their Facebook page that Bo is being well cared for. They write, "It is our understanding that the Autauga County Animal Control Officer was contacted and went to check on Bo. Family members were taking care of him. Through several Facebook posts, the family member assures other readers that the dog is well loved and will not be harmed. We are requesting that the Autauga County Animal Control Officer keep a periodic check on Bo. Thanks for all your concerns." If that doesn't work out for him, I bet he has a future in search-and-rescue! Oh boy! With Bailie being a tracking dog, Mom better not try to escape from police or it will not end well for her!